This is my second Grainline Studios sewing make. I love it. They have both been tops but both very different. If you would like to have a quick look at my other Grainline top (The Hemlock), you can see my review here. As with many of my recent makes, this has been another pattern that I have been meaning to sew up for quite a while. I absolutely love the simplicity of it, and how it would suit a number of different fabrics each giving it a different look. This pattern is suitable for woven fabrics, light to medium weight, such as cottons, lawns, crepes etc. 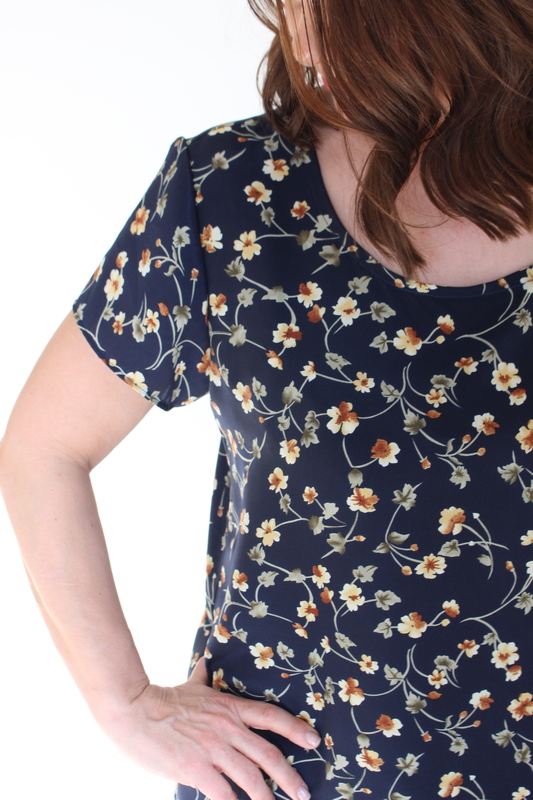 Whilst I had originally planned my first Scout Tee to be a classic cotton stripe I changed my mind to something more drapey and flowing and decided on a pretty navy blue floral crepe. So pleased I did, it’s shape is fitted at the shoulders and falls into a more relaxed fit below the bust which of course suits a crepe very well. Supplies need for this are very simple. Fabric and thread! Of course you will need fabric scissors or your rotary cutter and mat, and pins,but that pretty much is it! I used the paper pattern version (rather than PDF), which I was fortunate to choose as part of a prize in December given by The Sewing Directory as part of a fabulous quilt-along challenge they ran. My pattern came from Fabric HQ and if interested you can find it here. Thank you again to the Sewing Directory and Fabric HQ. This pattern is a breeze from start to finish. A beautiful instruction booklet takes you through the whole process clearly and simply. 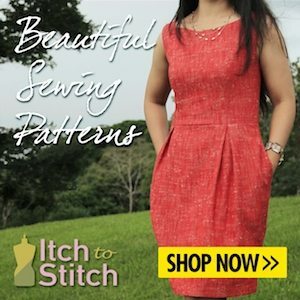 Only 4 pattern pieces are required ( a front piece, a back piece, a sleeve and a neckline binding). Simple. After stitching the front and back pieces together the sleeves are inserted in the regular way using gathering stitches to ease them in place. This went very smoothly and I was left with lovely neat sleeves. Binding the neckline came next. Once again good clear instructions were on hand to take you through this procedure with no problems. My neckline sits flat and was perfectly straighforward to attach. The final stage of this project is hemming the sleeves and around the bottom edge. A simple double fold hem is required and in no time at all you have a great little top. The back of the top sits slight lower than the front which I think is so feminine and flattering. I cannot wait to make more of these this year, probably using a cotton fabric next time to give it a completely different look. I would highly recommend the pattern as a must for your pattern collection. I love the effect that the crepe fabric has on this pattern. It turns a very basic shape into something very special. I can see this top worn with jeans, chinos, linen trousers or skirts. Easy to dress up or down. I hope this review has inspired you to take a look at your sewing basics. Whilst it is easy to get carried away with new releases and on-trend designs, these simple shapes are always ones we come back to time and time again. I am also happy to say that this is make number three on my #2017makenine list! Next post: Simple Sampler Quilt-Along. My first go at quilting. Love your Scout, Kathy and thanks for the mention! It looks great glad to see you enjoyed your prize.